Today, Magenta has announced pricing and availability for its first Android-powered smartphone with Garmin GPS Navigation. The Garminfone will be available sometime in June for $200 after rebate on a new 2-year contract with a qualifying rate plan, and $450 sans contract. The Garminfone will be HSPA 7.2Mbps capable and will be available with a number of branded services and applications on board. It will include full support for Garmin navigation features, and will come preloaded with Facebook and Twitter apps. If you haven’t already, be sure to check out our Quick Look at the Garminfone along with some exclusive in the wild pics of the handset. So now that the pricing has been revealed, who’s getting one? UPDATE: The folks over at Engadget have some additional hands-on snapshots of the Garminfone. Click here to check out the full gallery! $200 – really?!? This should sell….around 12 units. I’m glad Android 2.1 continues to make navigation units more and more irrelevant. I was gonna leave for the HTC Incredible on Verizon but now that I know I can get this Garmin phone for the same price, I’m staying!!! even tho i dont care for it, it shoulda been priced at $99.. it might drop to $99 (or $129) tho after a few months, by the time the holiday season starts.. i can’t believe they’re askin $200 tho! the damn HTC Incredible is $200! and this doesn’t even compare to the Incredible.. smh. isnt google maps navigation better? hell no. The maps on this phone is the best to date. Shock and dismay. If this phone is priced at 200, who’s to say the MT3GS won’t be just as much? I’m beginning to think T-Mobile is betting all their chips on customers not knowing the difference between a mid-range phone like this and a high-end phone like the Incredible or EVO. I worry for this company’s future. Don’t let ItsMichaelnotMike hear you bad mouthing Tmobile’s decisions. They’re marketing geniuses and never make mistakes. If they are pricing this at 199 they must have a good reason and tmobile is right and everyone else is wrong LOL. WOW,They are going to sell like hot cakes!!! Was there a typo in that page? $200 for this phone. Nah…. I see it at $99 also. You GOT to be kidding me. $200 for THIS? Yeah it would be nice to have for those long trips but DANG…. $200? Are you sure its not $200 BEFORE the mail in rebate? I say $150 should be the price… maybe even $130. This phone won’t sell that many and that I am sure of. Especially when there are phones that are much more powerful and feature rich. Its like asking $299 for a Playstation 2 and yet get a Playstation 3 with a bluray player built in for the same price. I just don’t get it Tmobile. PLEASE release the MyTouch Slide at a decent price point Tmobile… not more than $200…. pretty please? You know, even with my non-stop bitching I was actually giving this phone a chance since it looked like a great low-mid range device. A phone with low end specs and Garmin software? AWESOME! ..for 100-150 bucks that is. $200 bucks? REALLY? LMMFAO! So it’s okay to price this thing in Evo and Incredible territory?! LMAO, damn T-Mob – why don’t you just yell out “GO TO SPRINT OR VERIZON IF YOUR CONTRACT IS UP INSTEAD OF GOING WITH US!” while you at it. OMFG EVERYONE PANIC. Like always. The phone will launch at $200 and within 3 months will drop to $150. I’ve been playing with it for the last 2 days, and even though its not the best fit for me, I will say this: this one will actually sell. Its snappy, very responsive, comfortable to hold, and the native Garmin apps are very good, and very, very fast when compared to using an app like Where. There are more customers out there that want an easy to use device than those that want a superphone. So, yeah, this will definitely sell, but not until the price drops to $150. I don’t know why everyone is so negative about this phone. I used this phone today at the store. It’s pretty legit. I am liking the mytouch slide more, but the garmin phone is a good phone. Responsive. Sounded well. Apps work great. I think what many posters are failing to take into account is that an equivalent GPS Garmin unit would be at least $100. This is Android and Garmin combined! And no, Google Maps doesn’t do everything a Garmin unit can do. Garmin’s have maps preloaded in the device, same with this phone. Google Maps does not work without a data connection. With preloaded maps in this Garmin phone you can still be in the middle of nowhere and still navigate. A very important feature for those of us that have to make trips in the rural western USA! I actually got to play with this phone and the mytouch slide yesterday. I will be getting the slide for my fiancé it is definitely the best phone they have so far. And the garminfone really isn’t as bad as I thought it would be, has a very interesting cover over the android. 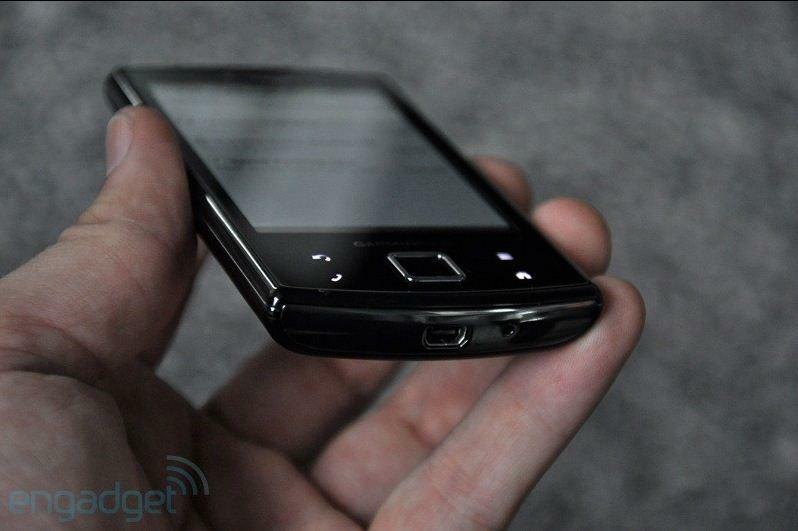 It is like a mix between A samsung highlight as far as the homescreen in a motorola cliq xt like shell. You would be surprised on how many people actually buy phones not really caring about processor or operating system. The people that are gonna buy this phone are the people who will only use it as a phone, not like alot of us where its more our phone/computer/entertainment they only use it as a phone the navigation is just a bonus to them. And really there is a lot of people out there like this. If you’re going to buy a phone that will eventually become obsolete (as they all will) you might as well get one with LIFETIME GPS NAVIGATION since the data plan is not required for it to work. At least it’ll still be worth the $100 you’d pay for a similar PND as opposed to the other phones that will be practically worthless. On the other hand, does anyone know if there are apps for Android or Windows Mobile 6.5 that provide similar GPS navigation without data service?